Only 30 minutes drive away from Byron Bay, Ballina, a beautiful coastal town with gorgeous beaches and a long list of must-do activities, makes a great day trip during your holiday. If you’re coming to the NSW for the first time, why not set up base in Byron Bay for local activities, as checking out the best of the surrounding towns (including Ballina). This coastal town provides visitors access to national parks, lots of water activities, an excellent museum and even the Giant Prawn. It has something for everyone from families to couples, to a group of mates on holiday. Whether you’re looking to simply visit one of the gorgeous beaches in the Ballina area or participate in some excellent surfing, Ballina has it all. A great place to start off your day is Shelly Beach. Here you’ll find not only a beautiful beach (which happens to be patrolled during school holidays) but also a wading pool that was built into the rocks on the southern end. If you decide to spend your morning (or at least some part of it here), head up for a snack or lunch at The Belle General, a café at Shelly Beach that offers up breakfast and lunch options as well as coffee and tea drinks and smoothies. In case you haven’t taken lessons while in Byron Bay or you’re continuing to improve your skills, you may consider grabbing a board and heading out to the waves while you’re in Ballina. Summerland Surf School offers surf lessons almost every morning where a standard two-hour lesson will cost $69 per person. If surfing isn’t your thing, then you might check out Ballina Kayaks, where you can spend a morning touring around Ballina’s coast. The three and a half hour tour includes a lesson, morning tea and touring around in the kayak seeing Ballina and the surrounding area from the water. The cost is $79.50 per person. Yet another option is fishing, if you’d prefer some quiet time while here in Ballina. Check out this article to find out about all the best fishing spots around town, and as for fish you might catch, these could include bream, jewfish, black marlin, flathead and whiting. There’s more to Ballina than just the beaches and surfing. If you enjoyed your visit to the Byron Bay Lighthouse (a must-do for your first visit to Byron Bay), then you should make sure to include the Richmond River Lighthouse to your day trip activities. The lighthouse looks just like the Fingal Head, Clarence River, Tacking Point and Crowdy Head Lighthouses. Built in 1879, the Richmond River Lighthouse was originally powered by colza oil, but switched to acetylene gas in 1920 and finally moved to electricity in the 1960s. Northern Rivers Community Gallery is another option for day trippers. This gallery is located in the former Ballina Municipal Council Chambers, which was built in 1927. In 2007 the Ballina Shire Council had the building renovated to modernise the lighting, climate control and security. It’s now the perfect location for visitors to view art exhibitions and other public programs. The gallery hosts a wide variety of local artists in all genres in its exhibitions as well as other events. Ballina markets: If you happen to plan a visit for a Sunday or especially the third Sunday of the month, you’ll be in luck and able to visit one or both of the regional markets where you’ll find both local produce and wares, such as arts, crafts and designs. You can check the schedule here. Summerland House Farm: This macadamia farm and avocado plantation features a tractor tour of the farm and plantation, as well as food-related activities such as the Grocer (farm products as well as other local produce) and the Cafe. In addition, there are some great options for families, including: mini golf, water spray park and playground, plus special school holiday activities. Thursday Plantation: A tea tree company, which makes products such as face cream, hair care, essential oils and oral care, allows visitors to learn more tea trees through the education centre. The location also features a cafe, rainforest botanical gardens, a tea tree maze and, as you would expect, a shop to purchase the company’s products. The Big Prawn: This famous “attraction” brings people just to see what the big deal is. The huge monument sits next to the Bunnings car park. Take your selfie and move on to your next Ballina thing to do! If you or anyone in your group on your holiday likes animals, then make sure to stop by the Australian Seabird Rescue, Research, Rehabilitation and Coastal Education Centre. Visits to the centre include an hour presentation from one of the trained volunteers and viewing whatever wildlife happens to be in the care of the centre at the time, ranging from pelicans to shore birds to even sea turtles. The Ballina Historic Waterfront Trail, which starts at the walkway at Fawcett Park in the central business district and ends at the North Wall. Look for all 19 plaques along the trail that provide interesting facts about Ballina. Speaking of history, if you enjoy it, then plan to make time to stop by and tour the Ballina Naval and Maritime Museum. The museum chronicles the area’s longtime maritime history, and highlights include the last remains of the Las Balsas Raft, which travelled from Ecuador to Australia, the largest collection of ship models in Australia and rare shipwreck treasures. Want to take other day trips? We’ve done the homework for you, and we have loads of advice on what to do once you get there. You’ll need a good, reasonably priced home base for your Byron Bay holiday—a place you can set up camp and feel good about staying while you experience not only all of Byron Bay, but the whole surrounding area. 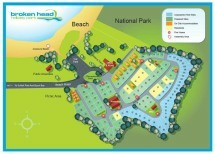 The Broken Head Holiday Park has excellent accommodation with something to suit whatever holiday you’d like; from non-powered campsites, to beach shacks. Check us out and book your stay soon!